Light weight Design for long time usage comfort. Yoke cable binaural Style fit for heavy duty application. Durable and sturdy Headset for entry-level requirements. 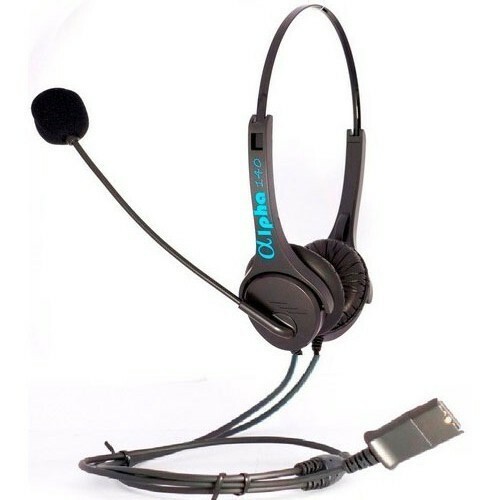 Our company has created a niche in the field of offering Alpha 140 EC Binaural Noise Cancellation Headset. Adjustable metallic Headband – comfortable and reliable for all day wearing. Lengthy Flexible mic boom design to position the Mic at appropriate distance. Microphone with Ultra Noise cancellation. Eazy Connect option to connect or remove quickly from bottom interface adapter/cables as per host phones. Soft Leather cushions for best wearing comfort. One Year replacement warranty against manufacturing defects only. Component level Spares support on chargeable basis for one year after the expiry of Warranty. Consumable spares parts like Ear cushion and Mic boom cushion on the chargeable basis if required for replacement during the Warranty period.